Due to my incapability to tighten the reigns when I'm let loose in the Boots beauty aisle, it ends up being quite some time before my purchases make it on to the blog. Today however, I'm giving some love to a product I've been obsessed with since it became mine last weekend. Despite being the big guns of the concealer scene, I find Collection to be a bit hit and miss. However before I even had the chance to cast my eyes over this Gorgeous Glow Blush Block, it managed to fall into my basket. AND it was on offer at just £2.99! I've always lusted after the original, the Bobbi Brown Shimmer Brick, yet the matte revolution left me with an allergy to anything with a hint of fairy dust. 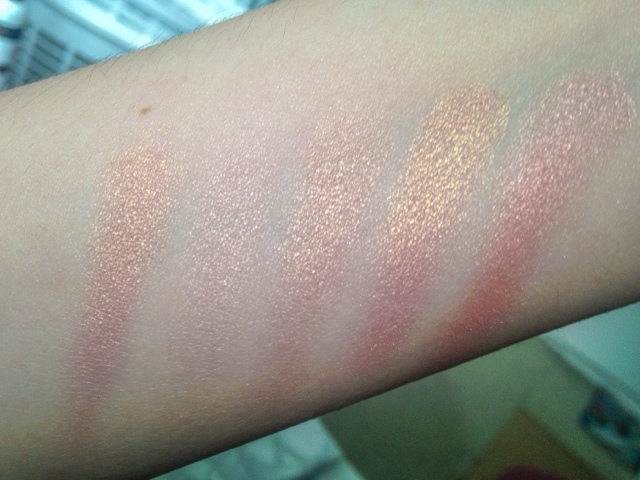 However the arrival of the Makeup Revolution Golden Sugar Palette (Review) reignited my love for the glowy cheek. Not to mention the highlight/blush hybrid makes for a serious timesaver. 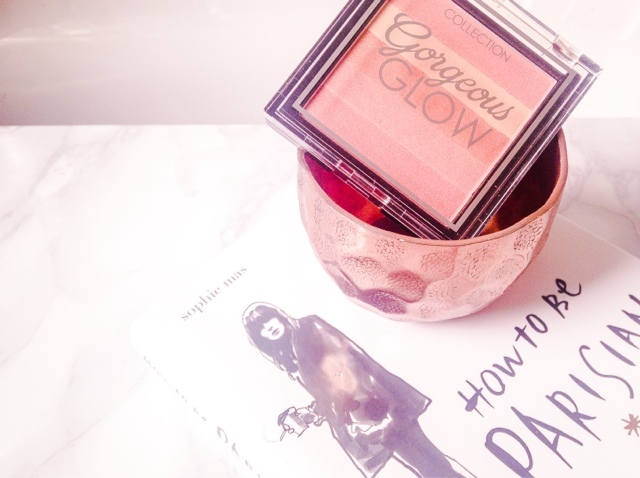 The Collection Gorgeous Glow Blush Block is seriously impressive for a drugstore product. The shades have that little something something that makes them unique. In this case each stripe of pigment has a beautiful golden shimmer running through, of which photos do no justice. The photo above shows all the shades swirled together; it is a gorgeous peachy pink that adds a stratospheric healthy glow to skin that usually belongs in Dullsville. The level of pigmentation is perfect; strong enough so it adds that noticeable finishing touch, but not so much that it is a recipe for disaster. Don't be tricked into thinking this is a glitter trap, the shimmery particles are very fine so nothing ends up looking OTT. Pretty good for a drugstore product. For office appropriate makeup, I like nothing more than a neutral one wash wonder on the lids. I've been loving using these shades individually. They aren't super pigmented as eyeshadows on their own, but combined with a spritz of setting spray on a 217 brings out a zjuzh of dual-toned shimmer. Particularly noteable is the lightest shade. 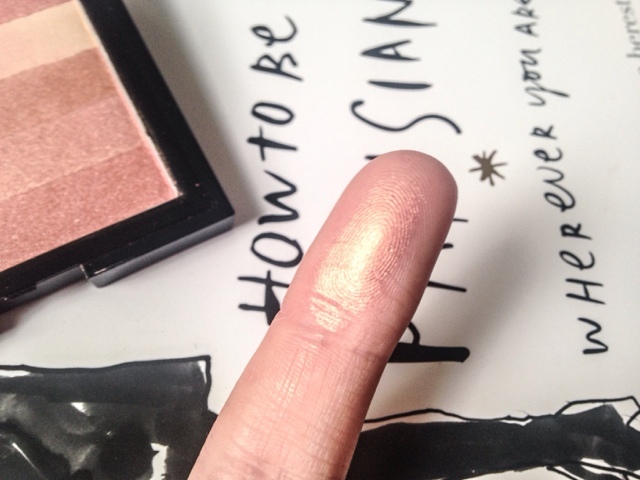 A very subtle champagne with an almost lilac toned shimmer, perfect for awakening tired lids without looking like you're wearing too much makeup. The rest of the shades are along the same vein of Mac All That Glitters and Expensive Pink, and there's a bit of an UD Naked 3 vibe in there too. Is this perhaps the best £2.99 I've ever spent? I think so. I'm pretty sure this will be staying in my makeup bag for a very long time, and it has restored my faith in Collection. In fact I'm planning to pick up their highlighting concealer and a few of their lipstick shades, which looked very nice indeed. If you're looking for an awesome addition to a summer travel makeup bag, the Collection Gorgeous Glow Blush Block (RRP £4.19) might just be it. Cheeks and eyes nailed in one.